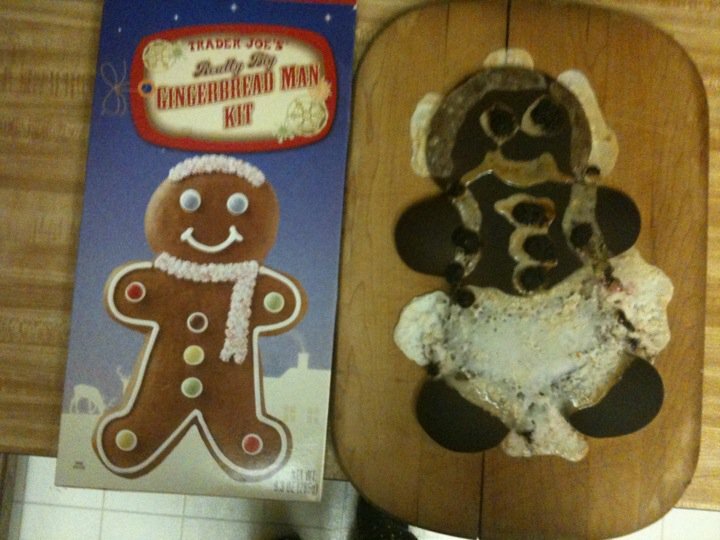 So, String Bean's aunt gave her this gingerbread man to decorate for Christmas, and she really did a great job decorating it. She became a cute little gingerbread girl, with a fluffy white skirt, puffy sleeves, candy buttons down the front of her blouse, and long, flowing icing hair. But then our cat kept trying to eat it (he's 16, and has some issues, and one of them is chronic food-eating without any accompanying weight gain). So I decided that, for gingerbread girl's protection, I'd store her in the oven. The next day, after a rough stretch of trying to get the girls down for bed, with hubby out of town, I decided I'd earned some cookies for dessert. So I turned on the oven to preheat. Then Peanut called me up to help her find her missing doll that she wanted to sleep with, and String Bean got into the mix by demanding water, a bathroom trip, and extra cuddling time. By the time I left her room, the house was filled with smoke. I told her to stay put, ran downstairs to see what the problem was, and there was poor gingerbread girl, burnt to a crisp in the oven. Oops! I might've been able to hide it, but String Bean just had to come down to see what the trouble was. I apologized profusely, and she might've been okay, if I hadn't started laughing hysterically at the same time. So, so much for my quiet night. Instead I got a smoke-filled house, a crying 5-year-old devastated by the untimely death of her gingerbread girl, and one ruined wooden cutting board. Hurray for mom!